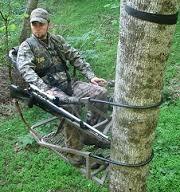 The fixed stand is the type that most people think of when they picture a tree stand in their mind. It consists of a platform that the hunter climbs a tree to set in place, then attaches to the tree trunk with straps, chains, ropes or other methods. Depending on the type and brand of fixed stand, it may have a small rail around the platform that can be used as a rest while shooting a weapon. When using a fixed stand for the first time, it’s a good idea to first attach it to the tree’s trunk at the bottom to ensure that you know how it should be set up, that it quietly holds your weight and to make sure there are no other issues with the stand. Permanent stands are just what they sound like—they’re stands that stay in the same tree at all times. This type of tree stand is homemade and generally constructed of wood. 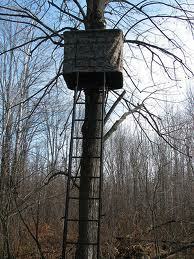 Depending on the hunter who builds the stand, it can be a simple platform or an elaborate blind that looks like a tree house. If using a permanent stand, you should inspect it often since wear and tear can make them unsafe in a short amount of time. Ladder stands are platforms that are attached to the top of a ladder. You attach it to the trunk of a tree and then climb the ladder to get to the platform. This type of stand has some distinct pros and cons. 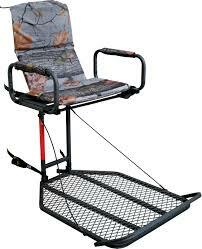 It’s a very stable and safe tree stand and much easier to get into than other types of stands. However, this type of stand is big and hard to move from one place to another. It’s hard to conceal so that animals in the area will see it and may become scared and leave the area. If this is the type of stand you will use, it’s best to pick an area where you intend to hunt and erect the stand in the off-season for use during hunting season. This will give the animals of the area time to get used to the stand and they’ll ignore it and not be afraid to come near it. Climbing stands come in a wide variety of models, but they all operate in basically the same way. This type of stand is built with an upper and lower platform. The hunter will operate the top platform that grips the tree. The hunter then moves the lower platform that releases the tension allowing the hunter to slide further up the tree. This motion is repeated over and over until the desired location in the tree is reached. A hunter climbing a tree with a climbing stand will look like they are imitating the motion of an inchworm. Some styles of climbers can be used from the sitting position and some are used while standing. 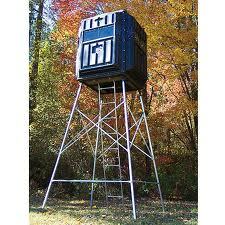 Tower stands were developed for areas where there aren’t many trees that will support the weight of a typical tree stand. A tower stand is a freestanding platform situated on top of three or more legs. The legs of some models can be adjusted to different heights. 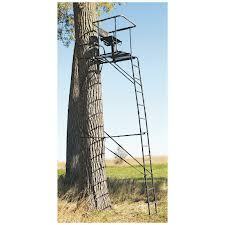 This type of stand is large and heavy and has the same pros and cons as a ladder stand, but in certain areas a tower stand may be the only choice.